The Translational Nutrition research team in the Department of Gastroenterology are researching the impact of a high fibre, high prebiotic diet. What are the health benefits of eating a diet high in prebiotics? Which foods are naturally high in prebiotics? Some foods such as legumes produce excessive wind. How can I reduce this effect of a high fibre diet that includes legumes/pulses? What are some of the strategies for increasing my fibre intake? Dietary fibre, can be defined as ‘the edible parts of plants or analogous carbohydrates that are resistant to digestion and absorption in the human small intestine with complete or partial fermentation in the large intestine’. providing fermentation substrate for the production of short chain fatty acids (SCFA) acetate, propionate and butyrate. Some fibre types (eg. resistant starch) are a good substrate for the production of butyrate (a SCFA with a special role in keeping the gut healthy). slowing the rate of absorption from the small intestine (eg. lower the glycemic and insulinemic response). Different fibre types, however, vary in how well they perform these different roles. For example, there are some fibres that are particularly good at bulking and laxation. Resistant starch is an excellent substrate for the SCFA-butyrate production and fructans (inulin) are very effective at stimulating the growth of bacteria (i.e. prebiotic). For this reason it is important to eat a wide variety of foods to ensure you are getting enough of all the different fibre types. Dietary fibre has been credited with a host of health benefits, including the potential to reduce the risk of coronary heart disease, stroke, hypertension, diabetes, obesity and certain gastrointestinal disorders. Adequate intakes of dietary fibre may also improve blood lipid profiles, reduce blood pressure, improve glycaemic control, improve laxation, promote weight loss and improve immune function. A prebiotic is a type of fibre (but not all fibre is prebiotic). To be classified as a prebiotic, the fibre must pass through the GI tract undigested and stimulate the growth and/or activity of certain ‘good’ bacteria in the large intestine. 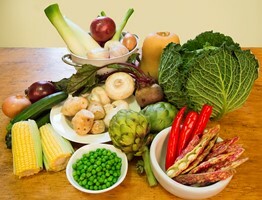 Prebiotics include fructans and galacto-oligosachairdes (GOS). See Table 1 below for examples of food that are naturally high in prebiotics. Because prebiotics are a relatively new discovery, evidence supporting their health benefit is only beginning to emerge. Some health benefits attributed to prebiotic intake includes modulation of the gut microbiota, improved mineral absorption, possible protection against colon cancer, improved blood glucose and insulin profiles, protection against intestinal infections and alterations in the progress of some inflammatory conditions. One way of increasing the number of good bacteria in the gut is by eating prebiotics. It is important to note that in addition to natural ‘prebiotics’, many of these foods are also excellent sources of dietary fibre (roughage) and resistant starch. 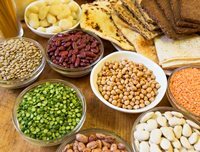 How do I reduce flatulence or 'wind' on a high fibre diet including legumes/pulses? Some foods such as legumes produce excessive wind. The wind is the result of excessive gas produced through the action of the gut microflora. This often happens when people change from a low fibre diet to include very high fibre foods such as legumes. We recommend you introduce these high fibre foods very gradually over 7 days. This will give your gut and gut bacteria time to adapt to the greater quantity of fibre arriving in the large bowel. You should have less problems with excessive ‘wind’. The National Health and Medical Research Council recommend that women and men consume at least 25g and 30g of fibre per day, respectively. Despite these recommendations, many Australians do not eat enough fibre. What are some strategies I could use to increase my fibre intake? The following strategies may help you to increase your fibre intake. o Snack on fruit, nuts, and seeds. o Add legumes and lentils to soups, casseroles and salads. I have medically diagnosed irritable bowel syndrome (IBS) and have been advised to avoid eating many of the high prebiotic foods listed here. If you have received a diagnosis of IBS by your doctor then you may have been placed on the ‘Monash University low FODMAP diet’. The low FODMAP diet is a special therapeutic diet designed to alleviate the undesirable gastrointestinal symptoms associated with this condition. You must seek the guidance of a qualified dietitian with experience in this area. We recommend that the Low FODMAP diet is followed for a period of 2-6 weeks followed by review from your dietitian. Your dietitian will provide advice on which foods (and how much) can be re-introduced. The long-term goal of dietary management is for you to be able to return to a normal diet (that includes high fibre foods) with no (or very few) dietary restriction. You must seek advice from a health professional before restricting your FODMAP intake. A low FODMAP diet will reduce the intake of foods high in fibre and natural prebiotics, which in turn may impact of the growth of certain bacteria in the gut. This is why we advise against following a strict low FODMAP diet unnecessarily.